Start in the heart of downtown Watsonville and wander along the scenic paths surrounding 800 acres of wetlands. Why go in summer: Strawberries are red and ready in this cool coastal town. Hot much? The average July high is just 72°. Key crop: Last year, the fields around Watsonville shipped out 87.5 million trays of strawberries. 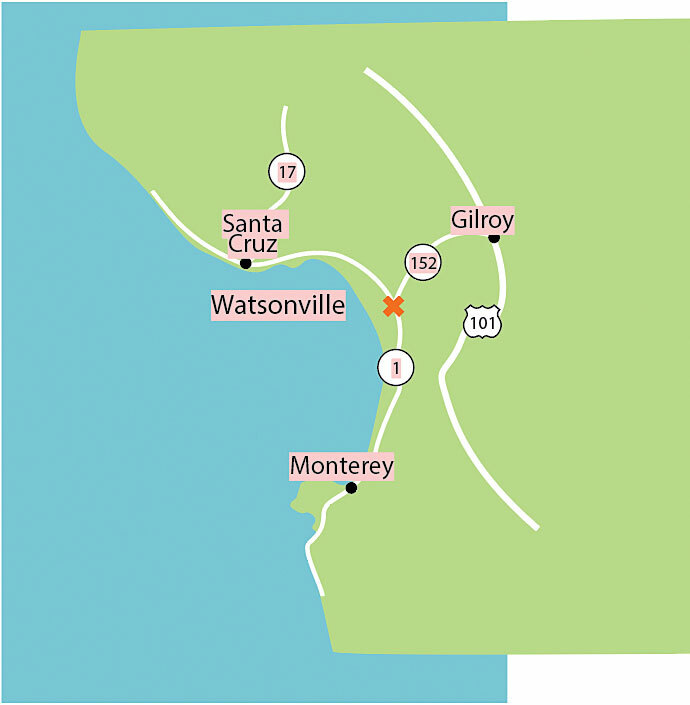 Getting to Watsonville: The city sits just off State 1, about halfway between Santa Cruz and Monterey. Scenic route: Most people stop by for a hit of farm-town flavor on their way along the coast between Santa Cruz and Monterey, but the more dramatic approach is over winding Hecker Pass Road/State 152 from Gilroy. Fresh graze: Among the piles of local produce at the Friday farmers’ market (3–7; City Plaza; 831/234-9511), empanadas, tamales, and churros are cooked on the spot. Unmanned stand: Pick up flowers, veggies, and berries at Crystal Bay Farm (40 Zils Rd. ; 831/724-4137), then plunk the suggested amount into the can. Plow on: In the charming two-story barn of the Agricultural History Project (free; 2601 E. Lake Ave.), ID apples and check out some seriously rickety tractors. Go hunting: For murals—13 new ones show off Watsonville’s agricultural roots. Our fave: the mammoth apple and strawberry produce labels on Union Street, near East Beach. 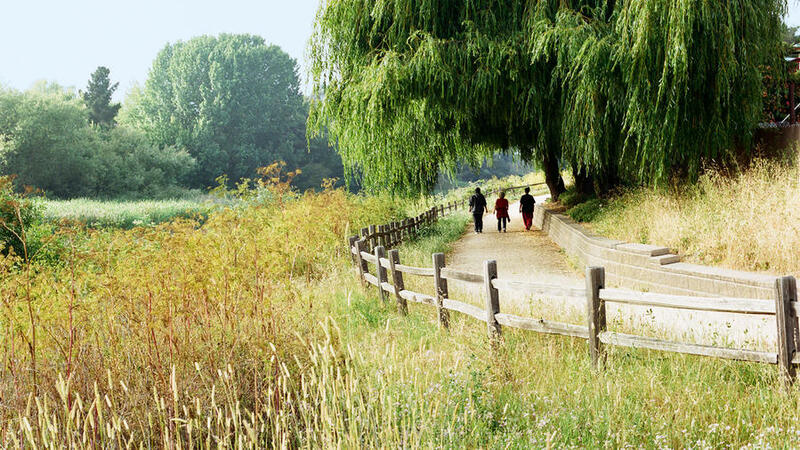 Joggers, cyclists, dog owners, and birders are loving the 6 miles of new scenic paths along the 800 acres of preserved wetlands that start in the heart of town. Take any of the 29 trail entrances, and you’re in another (watery) world. At 1:30 on Sunday afternoons, free docent-led walks leave from the Nature Center behind Ramsay Park. 30 Harkins Slough Rd. Drive past fields of strawberries to discover the open stretch of sand and surf that makes up Watsonville’s Sunset State Beach. You have to cruise through acres of strawberry fields to find Sunset State Beach. No wonder so many miss the longest stretch of open sand in the area. Climb to the top of the glider port for a 3½-mile panorama of waterfront homes, bottlenose dolphins, and—if you time it right—an unforgettable pink to reddish sunset. $10 parking; 201 Sunset Beach Rd. ; 831/763-7063. Fill your baskets with freshly-picked strawberries from Gizdich Ranch. For many families, summer means one thing: a trip to pick strawberries at Gizdich Ranch. Fill baskets you brought with as many berries as you can handle, then pay by the pound. Afterward, down a slice of freshly made mile-high strawberry pie at the picnic tables outside the farmhouse. Don’t leave until you’ve tried the famous slushie: half-frozen juice from apples grown right here. On a hot day, it’s the best $2 you can spend. 55 Peckham Rd. Save your tough questions about plants that’ll thrive in the California coastal climate for the folks at Sierra Azul, a family-owned nursery specializing in just that. Check out the sculpture garden while the kids climb around in playhouses hand-carved from stumps. A sprawling lawn is a peaceful spot to spread out a lunch and stay awhile. 2660 E. Lake Ave.; 831/728-2532. $3.25: The walk-up window at El Frijolito is literally a hole in a wall on the side of a building. You can sit inside, but it’s more fun to order and eat the famous gigantic beef burrito outside. 11 Alexander St.; 831/724-8823. $3.50: At the Pajaro Food Center, the made-to-order torta is a bun loaded with grilled steak, sour cream, tomato, grilled onions, and a choice of jalapeño, salsa, or avocado. Well worth the wait. 307 Salinas Rd. ; 831/724-3654. $2: The Tamal Factory’s dessert tamale, packed with pineapple and raisins, is a tasty, not-too-sweet afternoon boost. 611 Main St.; 831/724-7214.